The Rigi, also known as “Queen of the Mountains” showing up this morning, after that massive snow fall over night (more than 1 meter of new snow in higher areas). 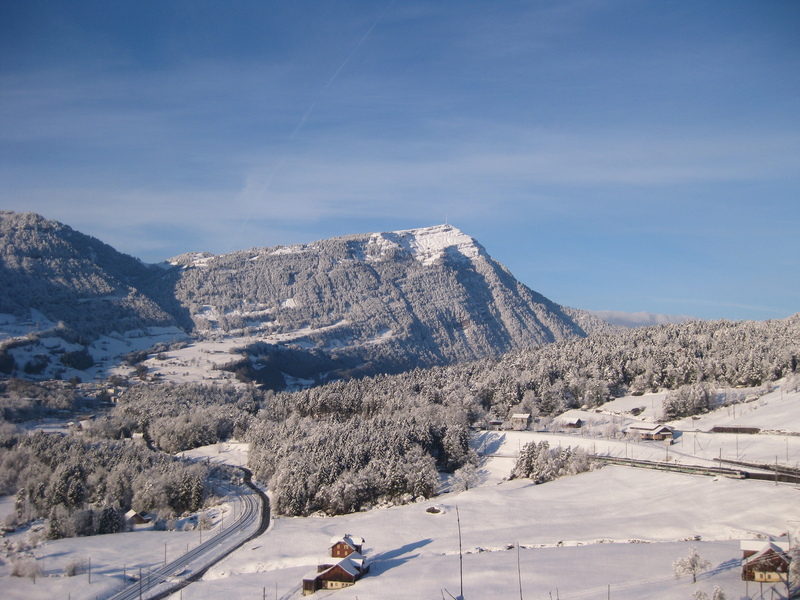 Starting in the 18th century, the Rigi-Kulm (in the center of the image, with a tall antenna on top of it) at 1798 meters above sea level is accessible with two rack railways, one from Arth-Goldau (where I live nearby) and one from Vitznau (on the other side of the mountain, near Lucerne). The railway from Vitznau started 1871 and was the first mountain railway in the Europe. On the left lower side you can see the Swiss Federal Railway SBB railway to the south/Italy, an on the right a Südostbahn (SOB) train heading to my home town.